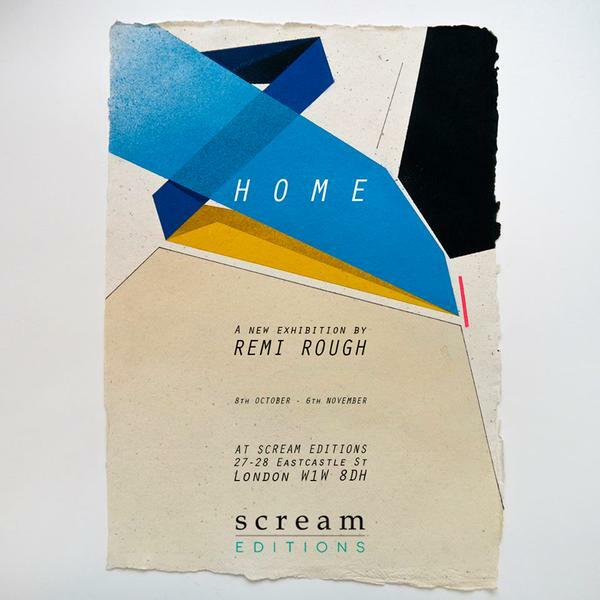 ‘Home' is Remi Rough’s first London solo exhibition of new works since 2009 and represents a homecoming for the artist. Home alludes to London itself. Remi Rough was born in South East London in 1971 and has lived and worked in the city ever since. He is a leading figure within the new movement of urban modernist painters (Graffuturists / Graffuturism) - Remi has adopted the theories and practices of the modern masters that preceded him. This new body of work explores the relationship of balance, tension and colour with geometric theory. The many formative years spent as a young practitioner of ‘graffiti style writing' have referenced these forward thinking abstractions. The letterforms and wild styles have progressed into a mature language of ‘Suprematism’. The works are precisely designed geometric compositions that contrast heavily with their organic surfaces such as hand made papers or wood assemblages. They have more in common with the Russian constructivists of the 19th Century as they do the graffiti writers of the 20th Century. The paintings are concerned with mathematical questions of shape, size, relative position of figures and forms, which is fundamental in current human obsession with practical science.